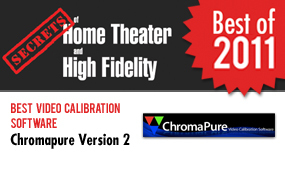 ChromaPure is new, very easy to use, calibration software designed by experienced professional calibrator Tom Huffman. Doesn't matter if you're new to calibration or a seasoned professional, ChromaPure provides all the features you need. Our very own free 'Greyscale & Colour Calibration for Dummies' guide was designed around Tom's easy to follow workflow process so anyone familiar with our guide should feel right at home with ChromaPure software. Even expensive video displays are often adjusted at the factory to make the best impression on well-lit show room floors. This generally means bluish whites, elevated black levels, excessive edge enhancement, and peak whites that preclude comfortable viewing. When you get the video display home under realistic viewing conditions many are shocked at the difference. Most displays do not have accurate colour out-of-the-box. Fortunately, it is becoming increasingly common for manufacturers to offer built-in colour management systems that allow users with the right equipment and software to dial in industry standard colour. Without this calibration you are not viewing television and film the way it was intended to be seen. The display's performance is presented in colourful charts and precise numerical values, both of which can update in real time as calibration adjustments are made. 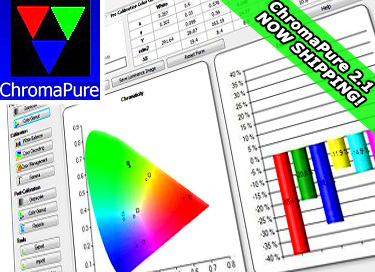 For complete details, meter support, and sample videos, see our ChromaPure order page. Heads up that ChromaPure v2 is coming soon! We've worked out a special deal: Anyone purchasing ChromaPure at our CurtPalme.com discounted price (either standalone or in a package) will automatically get a free upgrade to v2 once released! ChromaPure v2 will include tight integration with the new DVDO iScan Duo video processor, enhanced colour management, and possibly other other goodies that we can't mention now. Purchase ChromaPure now and get the upgrade later this summer for free! Are you enjoying using ChromaPure? Post here and let us know! ChromaPure 2.0 is now shipping! Upgrades are free for customers who purchased after June 1, 2010. Email us at chromapure@curtpalme.com for details. A new Professional version is also now available that supports an unlimited number of meters and signal generators including many new professional grade models - all for one low price! Until the end of September we're offering a ChromaPure Standard to Professional upgrade for only $100 instead of $800! So for about the cost of one extra meter licence, you get support for all meters plus all the extra pro features. A real bargain - Even for home users interested in adding just one extra meter any time in the future. Only available until the end of September 2010! Users can now click File, New Session to clear out all existing data and start a new calibration session. The active meter connection remains. The Raw Data module now includes an option for data export to .csv file. Gamma module now includes RGB data. The Color Management module now includes support for 3 color spaces: HSL, RGB, and xyY. The Grayscale and Color Gamut modules now allow user to select any reading at any time. Auto-advance is maintained. The Reports module brings back support for Excel-based reports. Integrated reports are maintained. There was a bug that resulted in unpredictable results and instability with the French character set. This has been fixed. There was a bug with the X-Rite Hubble in which it would read only fL. It now reports luminance in fL and cd/m2 correctly. Because of the placement of the OK and Cancel buttons on the Options window, they would not appear when using some some video cards. This has been fixed. Current ChromaPure users who purchased on or after June 1, 2010 are entitled to a free upgrade to Version 2.0. Email us at chromapure@curtpalme.com for your free upgrade instructions! All other users may upgrade from any earlier version to ChromaPure Standard 2.0 for a special CurtPalme.com discounted price of $55.95. See our ChromaPure order page. Any existing ChromaPure user who has upgraded to 2.0 may also upgrade their license to the new Professional version now for $100. This is a one-time-only discounted offer and is good only through September 30, 2010 for existing customers. After that, all upgrades from Standard to Professional version will be $800. Thinking of adding one extra meter? Upgrade now for about the same price and automatically add all meters! See our ChromaPure order page. Too good a deal not to get the pro version!!!! I did the same for CalMan before it went way way up! I need anew tri stimulus probe anyhow so the C5 and Chromapure is perfect for me. Keep getting these great deals Kal!!! Too good a deal not to get the pro version!!!! Thanks for your order Athanasios! Normally it costs about $100 to add a meter to ChromaPure. Now for the same price (until end of September) existing customers can upgrade to ChromaPure PRO which gives you access to *ALL* the meters. So anyone looking at ever adding a different or better meter some time in the future can automatically open up the door today and leave their options open. We sell bare meters too (no software) so it's easy to do. You'll also get the Duo and Radiance auto-calibration when it comes out in the fall. Own a Duo or Radiance video processor? Just click a button in ChromaPure and have it automatically calibrate your TV. It's really that simple. This is a significant upgrade, in many ways even more profound an upgrade than 2.0! For complete details as well as new videos, see our ChromaPure order page. Version 2.1.1 is now available for download. This is a maintenance release to address some issues discovered in 2.1. •When using 75% Rec. 709 in the Color Management module, the application used 100% saturation as a target for green. This has been corrected. •When importing data saved from a 5% grayscale session, the luminance at 85% was incorrect. This has been corrected. •When importing a session that used meter corrections (either application-level corrections or PRO meter corrections), the user could not take new measurements. This has been fixed. •When importing a session that used meter corrections (either application-level corrections or PRO meter corrections), the data did not reflect the corrected readings. This has been fixed. •Test patterns for the Lumagen Radiance are now forced into the Adjustable mode. 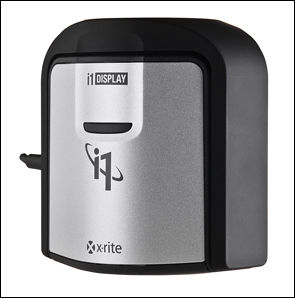 • Support for the new X-Rite i1 Display Pro III (Display 3) colorimeter. • ChromaPure's AccuPel video test pattern generator support now includes all SD and HD European formats. • We improved the performance for the DVDO Duo when using auto-calibrate. • We have enhanced support for the JETI 1211 spectroradiometer. - Support for the Photo Research PR-650 in ChromaPure Professional. - During routine testing we found a bug that could reduce the accuracy of measurements of PRO meters. This has been fixed. Anyone using a PRO meter (Display 3 PRO, Display 2/LT PRO, Chroma 5 PRO, DTP-94 PRO) should upgrade. Version 2.2.5 is now available for download. The resolution of problems with the PRO corrections in the previous release revealed another problem that was previously masked by the error 2.2.4 fixed. We had intentionally reduced the speed of the Display 3 readings below 10 cd/m2 to improve repeatability. However, doing do disabled the PRO corrections for those readings (continuous measurements, single measurements above 10 cd/m2, and all measurements with meters other than the Display 3 were unaffected). This problem has been fixed. Version 2.2.7 is now available for download. PRO meters now include corrections for LG LED and LCD displays. 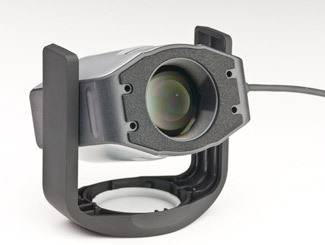 In consultation with X-Rite, we made an adjustment to our i1 Display Pro III support that provides significantly better repeatability at low light levels. The Color Management module now includes a CIE chart. The Advanced Color Management module now includes support for the Lumagen Radiance as a signal generator. When initializing the JETI 1211 spectroradiometer, the application now automatically measures and sets the cycle rate of the target display. The AccuPel signal generator would lose default settings after working in the Advanced Color Management module. This has been fixed. Connection to the selected meter would be lost when cancelling out of the Options module. This has been fixed. If the user neglected to initialize a meter before selecting auto-advance, the system would become unstable when taking grayscale readings. The system allowed users to select a null value from the signal generator drop-down. This has been fixed. Version 2.2.8 is now available for download. There is only one change in this build. After additional testing and customer comments, we have further refined support for the i1 Display Pro III (Display 3) colorimeter. This version offers a better compromise between speed and low-light repeatability. There are two things to keep in mind about this version. 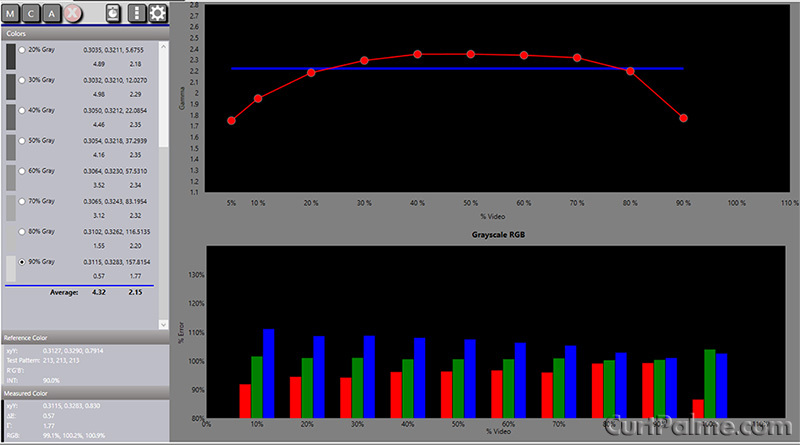 Do not use measurement smoothing with the Display 3 colorimeter. It will only slow readings down without improving repeatability. It still may be useful with other color analyzers. Hmm Weird, my version is 2.3.00xxx. But Tom sent me mine when I ordered the new display3. I wonder what I should do? Strange. Email Tom at chromapure@curtpalme.com if you like to figure out what's up. EDIT: If I remember correctly you have a ChromaPure professional licence. I think the numbering may be different. Yeah I have the pro version, that might be the reason. Install the new version. This was just a mistake with our version numbering. Effective immediately, we've just dropped the prices on our Display 3 / ChromaPure meter packages! This brings the Display 3 + ChromaPure Standard package to the low price of $419 USD. Interested in putting the ChromaPure auto-calibrate to the test? Auto-calibrate allows anyone with little or no training in video technology to calibrate their display in just 5-10 minutes. We've just dropped the price on our already discounted Radiance video processor by another $200, now only $1395! That's $600 off the regular price. Free US/Canada shipping and equivalently discounted international shipping. Sale ends Dec 31, 2011! Comprehensive video calibration has been made easier with this new, lower-priced package. Simply add a RadianceMini3D (currently on sale) for a complete low-cost auto-calibration solution! ChromaPure Auto-Calibrate allows anyone with little or no training in video technology to fully calibrate their display with almost no user input. Just setup a few simple options, click Auto-Calibrate, and then just go have a cup of coffee while the process completes. In less than 10 minutes your display will be full calibrated to professional standards. The package of tools does all the work for you! ChromaPure Auto-Calibrate works in conjunction with a DVDO Duo or Lumagen Radiance external video processor. The processor acts as both a test pattern signal generator and calibration device. The ChromaPure Auto-Calibrate software controls the processor and the Display 3 PRO color analyzer to get the most out of your display. It will even generate a before and after calibration report for you. For complete details on this package, see our ChromaPure order page. Watch the Auto-Calibrate demo video. ChromaPure and Radiance are winners in the Best of 2011 awards! Tom Huffman and his team for winning in the 'Best Calibration Software' category with ChromaPure 2! Two years in a row! 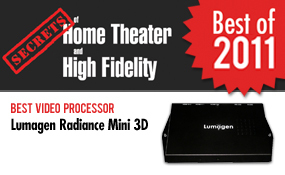 Jim Peterson and his time for winning in the new category 'Best Video Processor' with the new Radiance Mini 3D! "Initially, we were very impressed with ChromaPure and are happy to say that with the latest version that still holds true. The interface is still very clean and straightforward, making it easy to get started for anyone. The additional features offered in the new version have added more power and customization than was previously available, yet without added complexity. Overall, ChromaPure is still my choice for calibration software and what I plan to continue to use. When combined with the Lumagen Radiance, the results that I was able to achieve were even better. I had thought that an external CMS was somewhat outdated now that most displays and projectors included some sort of CMS, but I was certainly wrong in that regard. With the Radiance I was able to achieve results far beyond what I could do with the display controls, and a far better image as a result of it. Given all of the issues that we have found recently with Blu-ray players, receivers, and processors with how they handle colorspace information, adding an external CMS can resolve all of these issues, and give you a far better image to boot. It’s a piece of gear that I didn’t want to return, and that I hope to pick up for good in the future."